With the theme, Lip-Lap Lip-Lap Aidilfitri, this year’s Raya Celebration in Sungei Wang Plaza is filled with colourful lights and motives, bringing the joy and vibrancy of Raya to shoppers from 10 June to 26 July 2016. “For the first time in more than a decade, we are able to change the setting of our stage and showcase our mall’s festive decoration in a different manner. For this Raya, we erected a 20 feet tall ‘Kampung’ house in the middle of the concourse as our main feature of Raya decoration. 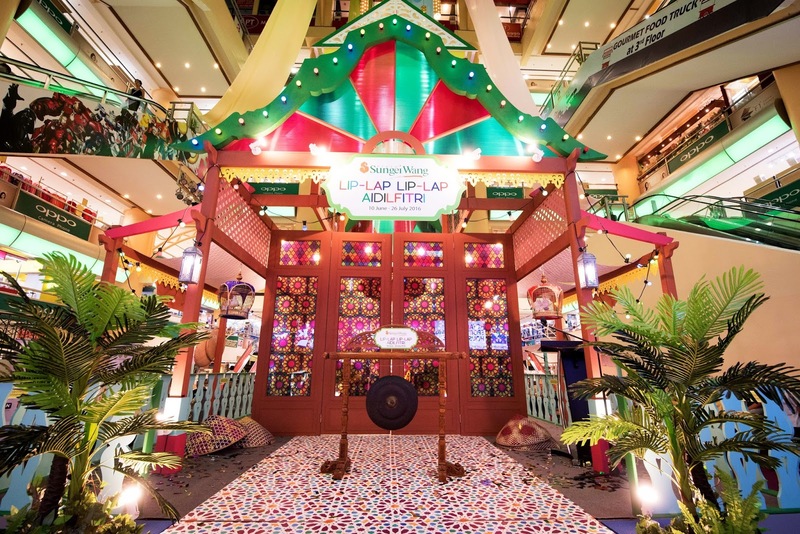 The colourful lights hung all around the house and along Sungei Wang Walk totaling more than 120 meter in length is to bring out the vibrant Raya festive mood in the mall. The ‘warung’ concept Ramadan Bazaar in our concourse captivate the festive ‘Kampung’ feel for shoppers while they hunt for their Raya goodies.” says Ms. Yuen May Chee, Complex Manager of Sungei Wang Plaza. All the artist and the VIP. This year’s Raya launch, Sungei Wang Plaza are delighted to have several celebrities and artistes celebrating with them. 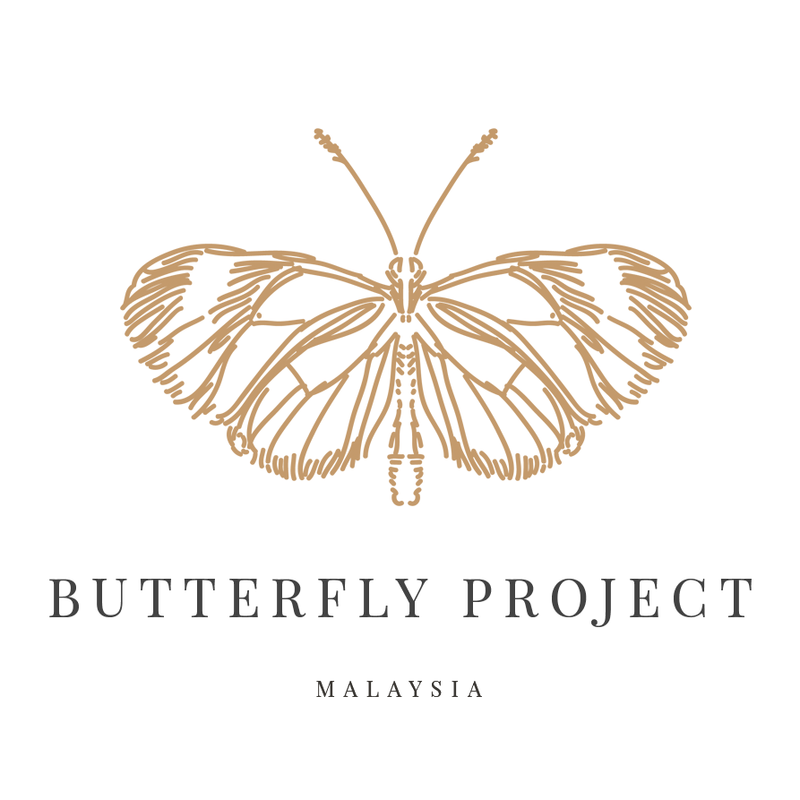 Natasha Charmaine was the honourable emcee for the night, Atikah Suhaime showed of her singing skills by presenting a song and Azwan Kombos and Vicha Saywho also made an appearance to hype up the launch. Not forgetting the underprivileged, they also invited kids from Rumah Bakti Al-Kausar to join them as well. A group of underprivileged kids from Rumah Bakti Al-Kausar presented their surprise gifts to their favourite idols. The launch kick started with a cultural dance performance by Jabatan Kebudayaan dan Kesenian Negara (JKKN). 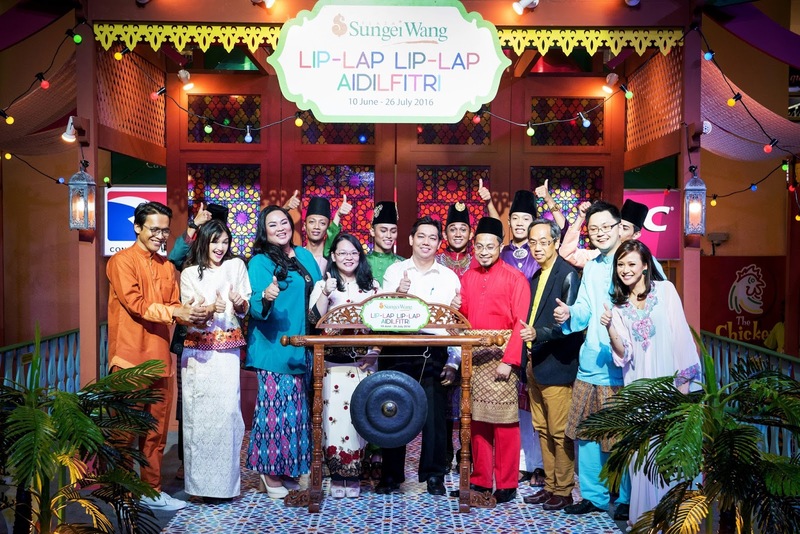 Thereafter, Yuen officiated Lip-Lap Lip-Lap Aidilfitri, Sungei Wang Plaza’s Raya campaign by hitting the ‘gong’ on stage together with Mr Joseph Teo, Head of Marketing Communications, artistes and celebrities. After the performance of the artistes, it was followed by an artwork presentation from the kids to their favourite idols. 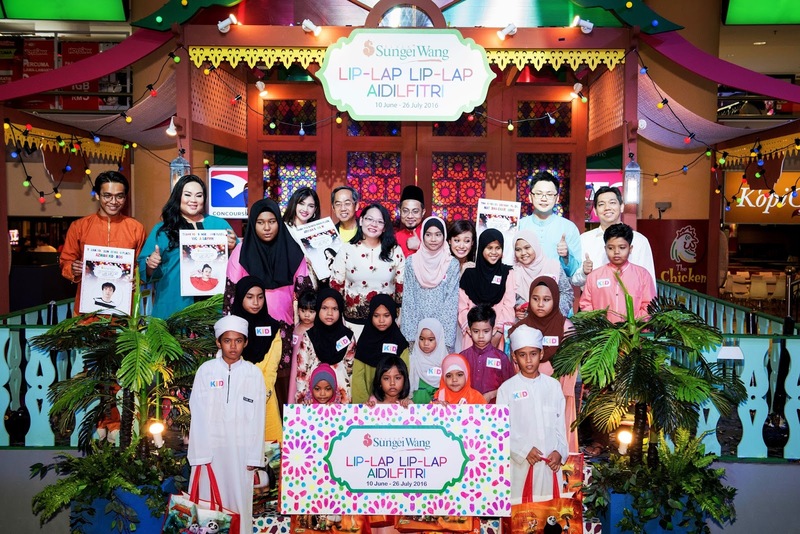 Thereafter, Sungei Wang Plaza presented their Raya goodie bags sponsored by Giant supermarket to the underprivileged kids. They were also treated with a ‘buka puasa’ session together with the celebrities at Nando’s. For those who missed their launch, there will be two other opportunities to meet up with your favourite artistes and celebrities that will be happening on 19 & 25 June 2016 featuring Aizat Hassan, Syaa Nasir, Nina Iskandar, Ernie Shaheerah, Julia Marin, Epy Kodiang and many more. Shoppers will have a chance to meet their idols up close and personal. Shoppers will be entertained with the vibrant and colourful cultural performances during the entire Ramadan weekends presented by JKKN. Shoppers are even invited to join the dancers in their performance and learn some cultural dances of Malaysia. To enhance the festive Raya mood, a series of exciting activities were planned for all shoppers. 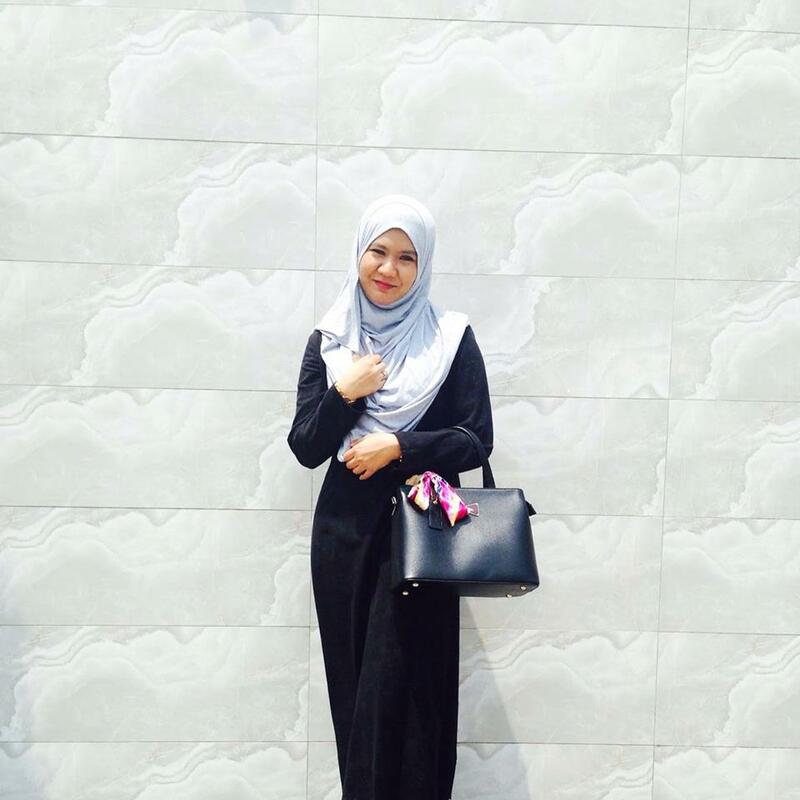 Come and join the Kuih Making Demonstration to learn how to make traditional Kuih by Ifa Raziah on 18 & 26 June 2016. Not only that, Bagus, a baking and culinary academy will be conducting Raya Cookies Making Demonstration on 19 & 25 June and 2 & 3 July 2016 as well. They will be giving away 1,000 traditional cookies recipe books and 500 boxes of cookies for lucky shoppers. So make sure to come early and secure your seat. As everyone knows, Teh Tarik is our national all-time favourite drink. 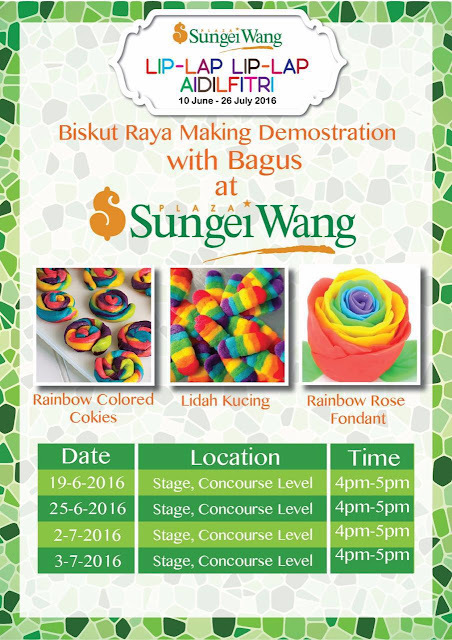 Be thrilled with Raja Tarik Sungei Wang Plaza Competition this 10 July 2016. 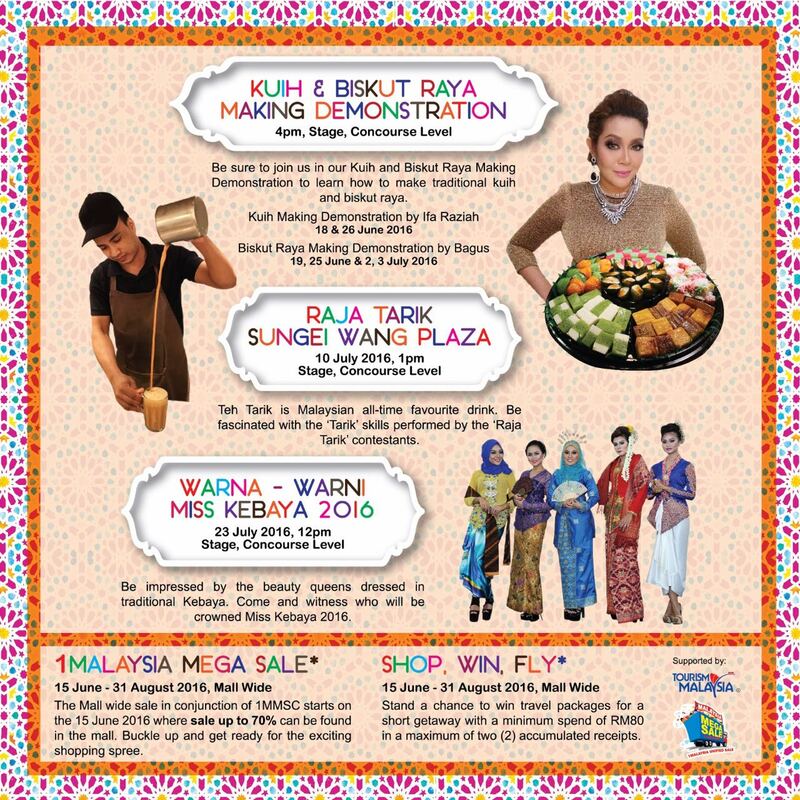 Come and be fascinated with the ‘Tarik’ skills performed by the ‘Raja Tarik’ contestants. To promote Malaysia as a cultural-rich country, Sungei Wang Plaza will also be hosting Warna-Warni Miss Kebaya 2016 at the Centre Court, Concourse Level on 23 July 2016. Be mesmerised with the beauty queens dressed in colourful traditional Kebaya and witness who will be crowned Miss Kebaya 2016. 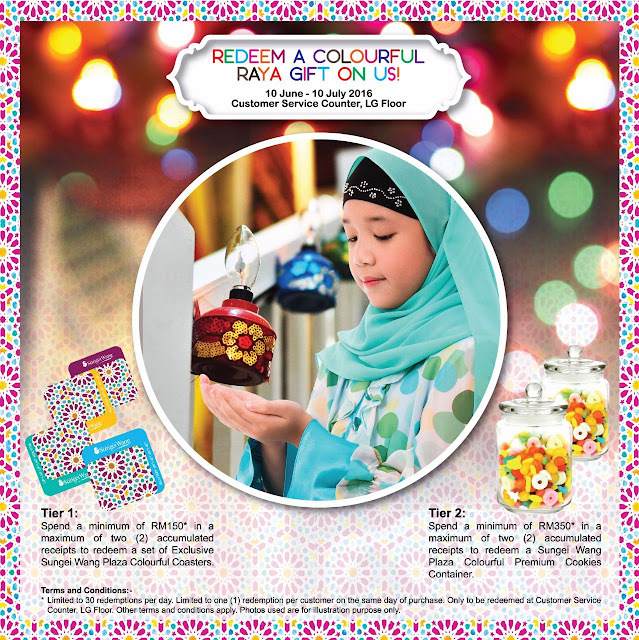 Do not forget to redeem your colourful Raya gifts from them! Shoppers who spend a minimum of RM150 in maximum of two accumulated receipts will be entitled to redeem a set of Exclusive Sungei Wang Plaza Colourful Coasters. Whereas, spending a minimum of RM350 in a maximum of two accumulated receipts will entitle you to redeem a Sungei Wang Plaza Colourful Premium Cookies Container. Terms and conditions apply. Discover more at Ramadhan Bazaar where an array of Raya delights and products ranging from cookies, apparels, accessories and many more in their ‘warung’ themed booths for all your Raya shopping needs. Here in Sungei Wang Plaza, there is always a good place for your ‘buka puasa’ session. More than 40 food and beverages outlets under one roof, you will be spoilt for choices to break fast. You can check my entry where I went to 10 great restaurant here in Sungei Wang HERE & HERE! Last but not least, Sungei Wang Plaza is decked out itself as a best place for all kinds of everything. They boast a vibrant mix of retailers & fashion designers, latest mobile phone & IT gadgets, home products, beauty & accessories and also a wide spectrum of mouth-watering foods & beverages. Public can head towards here to shop and also to have a delightful dine with family & friends, or simply to spend special moment with your loved ones! Positioned as the mall for “all kinds of everything”, Sungei Wang Plaza provides shoppers with an eclectic range of retail concepts and is particularly well known for its fashion, beauty and mobile phone-related offerings. The mall has an aggregate retail floor area approximately 800,000 square feet (sq ft) and key anchor tenants include Parkson & Giant Supermarket. Sungei Wang Plaza has received many local and international awards and accolades over the years, including the Kuala Lumpur Mayor’s Tourism Awards 2011 Award for Excellence in Shopping Mall Category and the prestigious FIABCI Prix d'Excellence under the Special Award (Retail Properties Category) in 1996.